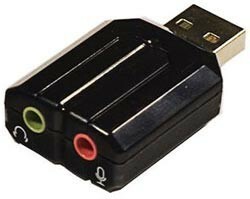 The USB-AUDIO adapter allows you to link your sound to a PC or MAC through the USB port instead of a sound card. Just plug in your headphones or speakers into the adapter and plug the adapter into a USB port. Stereo analog output – connect headphones or powered speakers to your PC or laptop. Compliant with USB 2.0 full speed operation. Compatible with Windows 98/ME/2000/XP/Server 2003/Vista/7, and MAC OS 10 and higher. Plug and play functionality – no drivers required. Mac OS X: device is recognized as "Generic Speaker/Microphone". Navigate to System Preferences > Sound Settings and select this device as the Output device. "The USB-AUDIO adapter really helped me out when my speaker jack stopped working on my computer."